Photo Polymer for use in all Asiga systems. General purpose ceramic filled white material. (Not for casting!) Suitable for use in RTV and low temperature vulcanized molds, or for direct manufacturing. 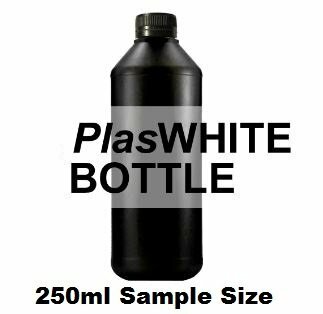 PlasWHITE is a high resolution photopolymer suitable for a wide range of applications. With ABS-like properties, PlasWHITE offers durability, stability, accuracy and excellent surface definition. For industries that require tooling grade resolution PlasWHITE is an excellent choice. It can be directly molded in RTV or low-temperature vulcanized rubber. If making vulcanized molds, you must dip the RP parts in Jett-Dri nanoparticle Teflon material so that it is easily removed from the cut mold.